What’s it about? Maud (Beatie Edney), the young heiress to the Ruthyn family fortune, has always been obsessed by the portrait of her dashing uncle Silas (Peter O’Toole), whom she has never met. The introduction into Maud’s life of a cruel, alcohol and drug-dependent governess and an encounter with a boorish young man mark the beginnings of a sinister conspiracy that may lead back to the uncle Maud idolises. Verdict: When Peter O’Toole died on the 14 December last year, the world of entertainment lost one of the true greats of stage and screen. An accomplished Shakespearean actor, eight-time Academy Award nominee and renowned hell-raiser, O’Toole will forever, primarily, be associated with the role of T.E. Lawrence in David Lean’s epic drama, Lawrence of Arabia (1962). Over 25 years later, O’Toole was offered the opportunity, which he seized with relish, to portray Silas Ruthyn, the laudanum-addicted villain of J. Sheridan Le Fanu’s 1864 Gothic mystery novel, Uncle Silas. Le Fanu’s novel, one of the earliest to feature a ‘locked door’ mystery, is something of a Gothic urtext, featuring as it does a stately home, inclement weather, an unhinged governess, gargoyles, madness, spider’s webs, dripping taps, sinister family members, graveyards and, most importantly of all, cold-blooded murder. Directed by Peter Hammond for the BBC as a three-hour, three-part series, and renamed The Dark Angel, this 1989 adaptation is a welcome inclusion in the BFI’s lengthy Gothic season. Its screenings also give audiences a sad and timely reminder, if any was needed, of O’Toole’s acting abilities and charismatic screen presence. Aside from the draw of seeing O’Toole inhabiting the role of Silas, and boy does he, The Dark Angel features a number of other reasons that make it worth seeking out; Jane Lapotaire’s delightfully OTT performance as the grotesque governess Madame de la Rougierre, Beatie Edney’s nuanced portrayal of Maud, the pure heart around which much corruption and depravity circles, Hammer alumni Barbara Shelley cast against type in one of her final roles, and Hammond’s woozy, wild and often visually symbolic take on the source material. Expressionistic camera angles, discordant score, hallucinatory POV shots, flashbacks and even a flash-forward are employed by Hammond to create a nightmarish, oppressive atmosphere that reflects the increasingly delirious events and the characters’ various states of mind. The real thrill of The Dark Angel isn’t the plot itself, being as it is a fairly straightforward tale of a family member wanting to get his hands on the fortune bequeathed to another, but the visualisation of it. Hammond, O’Toole and co heightened the levels of delirium, paranoia, dysfunction and terror in Le Fanu’s source material. The adaptation wallows in substance abuse, incestuous and Sapphic leanings, immorality and decadence. The death of Maud’s romanticised view of her uncle, and the world in general, is steeped in excess rather than melodrama, with an audacious incoherence to some scenes that mirrors Maud’s mental confusion. The Dark Angel flits between being tangibly sensual and ethereal, full bodied yet otherworldly. Despite the odd clunky moment and a lazy, trite climax, it remains one of the wildest literary adaptations the BBC has produced. Final Words: A satisfying, engrossing watch, The Dark Angel is sure to appeal to lovers of Gothic melodrama. O’Toole clearly had a ball playing Silas, and Hammond directs with a feel for the material, bringing the text alive with an artistic flourish not always seen in small screen adaptations. 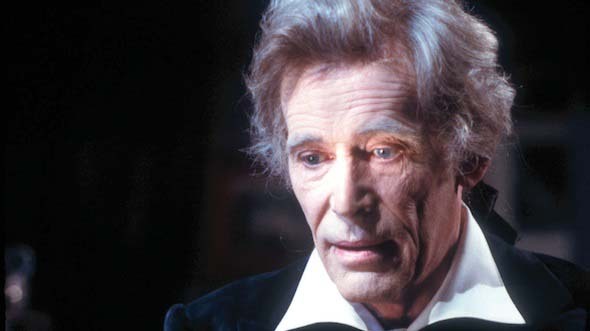 The BFI Gothic Season runs until February 2014. Visit www.bfi.org.uk/gothic for screenings and events around the UK.